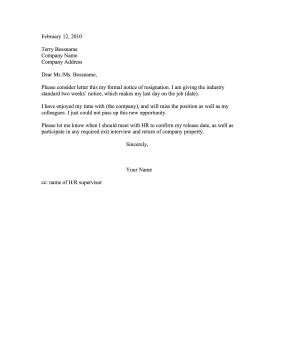 This printable resignation provides a departing employee's two weeks' notice. Please consider letter this my formal notice of resignation. I am giving the industry standard two weeks' notice, which makes my last day on the job (date). I have enjoyed my time with (the company), and will miss the position as well as my colleagues. I just could not pass up this new opportunity. Please let me know when I should meet with HR to confirm my release date, as well as participate in any required exit interview and return of company property.